For over two and a half centuries, the Cupola House has stood watch from the north shore of Edenton Bay. It was built in 1758 by Francis Corbin, land agent for John Carteret, Earl of Granville. Carteret was one of the last of the famous Lords Proprietors who, in the 17th century, acquired vast territories south of Virginia from King Charles II. Corbin died in 1767, and Dr. Samuel Dickinson purchased the house in 1777. His descendants called the Cupola House home for over 141 years. With limited income, the last of the family were unable to properly maintain the house. Weather and time eventually took its toll. The Cupola House’s once formal gardens were sold for commercial development until only 10 feet of space remained beside the house. Exterior paint was worn away, and the building was suffering from disrepair. Its loving, but impoverished, owners found no recourse but to sell off family treasures, such as the magnificent first floor Georgian woodworks. The house was threatened, and a historic landmark was near death. In 1918, citizens rallied to form an organization to save the Cupola House. 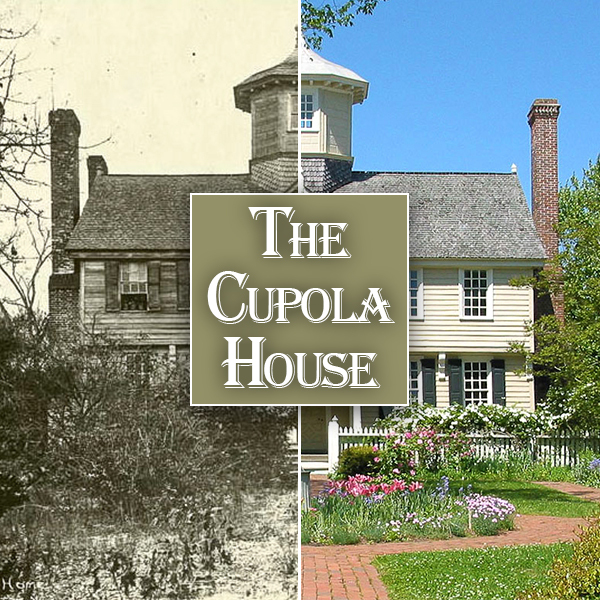 This organization eventually became The Cupola House Association, dedicated to its protection. Today the Cupola House stands proudly watching over the bay. The formal gardens have been restored. It is an anchor to the lovely town of Edenton and a memorial to those who cared and took action to save this architectural treasure.